Continuing the theme of the last two postings, on January 17, 2014 Discovery Canada returned to the realm of fantasy with the second episode of its fantasy-prone series Close Encounters. 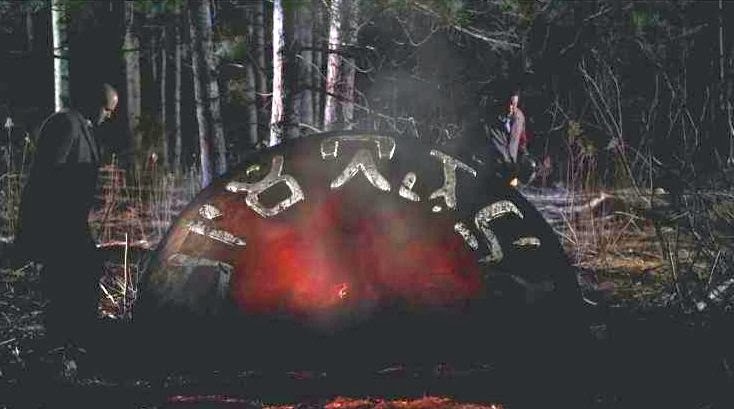 The first case of the episode depicted the tired old claims of a supposed saucer crash in the woods near Kecksburg, Pennsylvania on the evening of December 9, 1965. The talking heads were Stan Gordon, a UFO investigator who has spent literally most of his life investigating this case, and UFO author Leslie Kean, who we met in the first episode. The episode depicts the Kecksburg incident as told by volunteer fireman Jim Romanski. He received a phone call alterting him that there were reports of a plane crashing into the nearby woods. He rushed out to possibly render assistance. When they got to the spot, they supposedly found a massive, glowing metallic acorn, partially embedded in the soil. It had strange markings on it, like hierolglyphics. Oh, no! The Men In Black turn up, to seize the Acorn!! 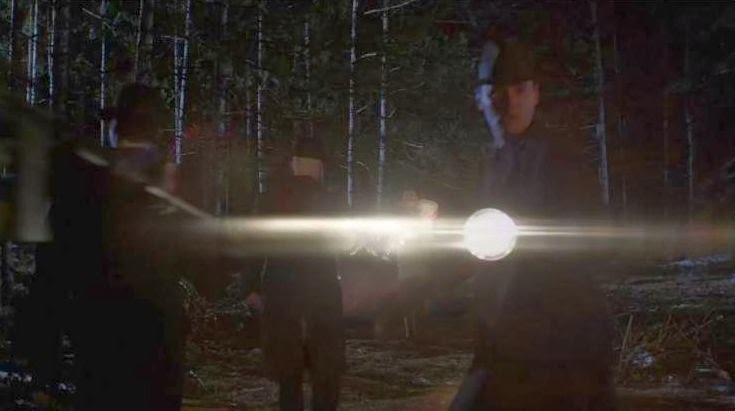 But no sooner did they begin to examine the object, when suddenly the Men In Black appeared (they didn't use that term, but it's obvious what they meant), followed by a bunch of soldiers. They ordered all civilians to leave the area. Romanski returned to his volunteer fire station, to find it was being occupied by soldiers, who would not allow him to enter. 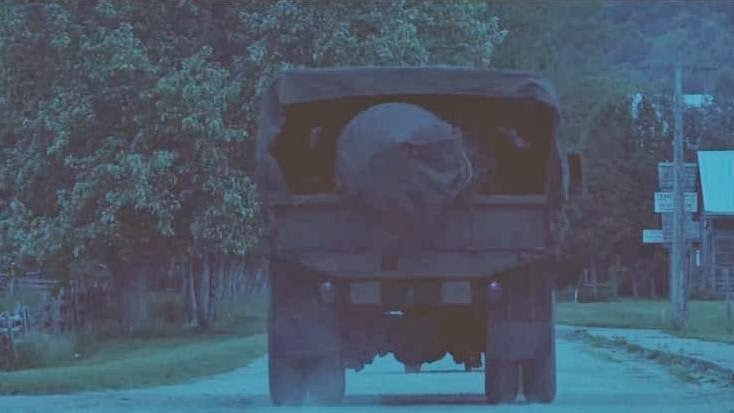 He then saw a military truck drive by, hauling away the acorn to wherever it is that the government hides its secret saucer stuff. They had apparently managed to lift that massive, half-buried metal object into the back of the truck without the benefit of any heavy equipment. Heave-ho! Such an incident of undeclared martial law would, of course, fly in the face of all American legal tradition and would itself be a matter of far greater concern than any falling acorn capsule. If it really happened, that is. What, if anything, crashed at Kecksburg that night? The reality is that a brilliant fireball meteor was widely seen across the eastern U.S. and Canada at about 4:42 PM on December 9, 1965, and studied extensively by scientists. Several scientific papers were published about it in astronomical journals. The supposed "crashing UFO" reported from Kecksburg matches exactly with the great fireball in time, and in direction. Astronomers Von Del Chamberlain and David J. Krause of the Abrams Planetarium, Michigan State University in East Lansing did an in-depth study of the reports of the Dec. 9th fireball from across a wide area of the U.S. and Canada. They published a scientific paper in the Journal of the Royal Astronomical Society of Canada (Aug. 1967- Vol. 61 no. 4, pp. 184-90). This object was in fact over a hundred miles from Kecksburg, "disappearing at a point over land some 15 miles south-east of Windsor [Ontario]". (Witnesses typically greatly underestimate the distance to brilliant fireballs such as this. See many examples in UFOs Explained by Philip J. Klass.) "The usual rash of early reports gave 'landing sites' for the object ranging from western Michigan to Pennsylvania... Loud sonic booms were heard in the Detroit-Windsor region." Using photographs of the object's trail from two different locations, Chamberlain and Krause were able to calculate the orbit of the meteor before it entered the earth's atmosphere. You can retrieve the full article on-line here . 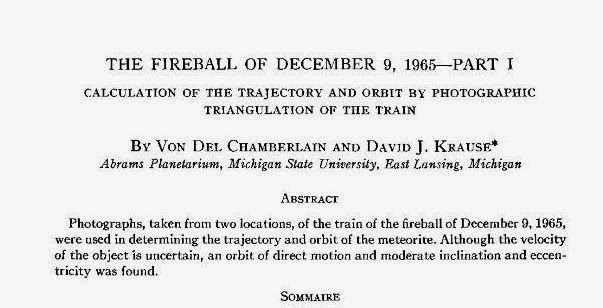 Chamberlain published a second scientific paper about the fireball: Chamberlain, Von Del, 1968: Meteorites of Michigan, Geological Survey Bulletin 5, East Lansing, Michigan: Michigan Department of Conservation, Geological Survey Division, pp. 1-5. 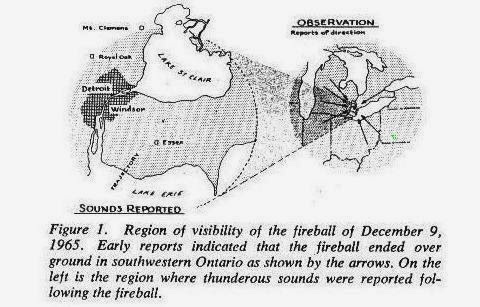 The fireball was observed by many people in Ontario, Michigan, Ohio, Pennsylvania, and to a lesser extent in neighboring states. In newspaper accounts, a great many supposed impact sites were reported, both in southwestern Pennsylvania and eastern Ohio. Fragments were claimed to have fallen in Ohio and Michigan. Robert Young's article identifying the Kecksburg "crash" was published as far back as the Spring, 1991 issue of The Skeptical Inquirer magazine (Vol. 15 no. 3): "Old-Solved Mysteries: The Kecksburg Incident." An updated version of "Old-Solved Mysteries" begins on p. 177 of the book The UFO Invasion, edited by Kendrick Frazier, Barry Karr, and Joe Nickell. (Prometheus Books, Buffalo, NY, 1997). With Kecksburg, we are in exactly the same position we are in with the 1996 Yukon UFO: we know beyond any doubt at all what the object was, but people in the UFO community refuse to accept this. Of course, the fine folk of Kecksburg can hardly be blamed for embracing a fable that finally places their humble hometown "on the map." 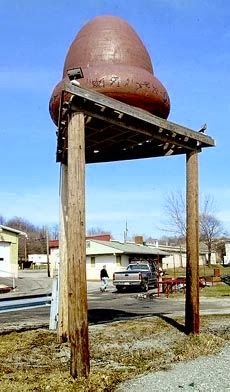 Indeed, they seem to have embraced it so fully that they have even erected a supposed full-size replica of the object in their town. Stan Gordon is a local UFO investigator who has made this one case virtually his entire UFOlogical legacy, so one should not be surprised to find him possessing a powerful will to believe in this case. Leslie Kean, however, has no such excuses. With all her experience and contacts in the UFO world, she surely cannot be unaware that the Kecksburg "crashed UFO" has been known to be the Great Lakes Fireball for more than twenty years. The narrator commented at the end of the segment, "But some astronomers continue to believe the object may have been a meteorite consisting of iron compounds," which is quite false. No astronomer is suggesting that a meteorite crashed near Kecksburg and buried itself in the ground. Astronomers know that observers in Pennsylvania, just like observers in Ohio and Michigan, were wrong in thinking that fragments of the meteorite had fallen nearby. Whatever remained of that fireball - probably not much at all - fell about 15 miles south-southeast of Windsor, Ontario. "Almost everyone who saw the fireball thought it was much closer than it really was." Robert, you present both compelling evidence and a closing argument that no one can logically argue against. Can Zippy also be called to testify in court cases? Slam and Dunk! And for sketchy, hackneyed, scripted "UFO" fairy tales for which there is not a single bit of supporting evidence, and that real-world knowledge, experience and circumstances indicate not only the high implausibility of a real event but hoaxing by the purported "witnesses," what can be the only logical determination, Curt? Extraordinary claims require extraordinary evidence. In logic, probability, and in real-world practical skepticism, the absence of evidence is evidence of absence. 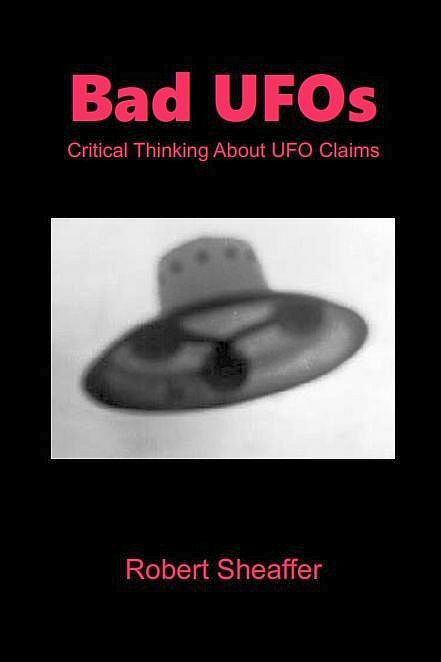 So evidenceless "UFO" stories aren't simply unproven, they're rightly dismissed as having never occurred. Your "feelings" about some truth to the story are irrelevant. You want science? The default position for any proposition or claim is the negation of that claim, the Null hypothesis. Show how any part of Betty and Vickie's highly implausible story--an utter and complete negative factually--could be true, okay? Zoam, your output appears to be set at "random." You might want to adjust your settings. Failing that, clear your cache and re-boot. If your problem persists, you may have to re-install your software. I also devoted an issue of SUNlite to this case, which included some additional writings by Bob Young regarding his investigations into the case. It was SUNlite 3-6. An excellent collection of articles. Page after page of solid refutation to claims that something "crashed" near Kecksburg. You mean it was not the Nazi Bell?? Well, there goes another infamous UFO story...I liked the part about the SS Runes on the edge of the Acorn...I think Cyrillic would be more likely if the remains of the Venera Probe landed in PA, but even that does not fit like the fireball...I have heard that the Venera reentry was too far away and not at the same time as this incident.. Figure 4 of the Royal Astronomical Society paper shows the "earth point"--where the meteor landed (and thus became a meteorite) (marked "E"). But the map doesn't show Kecksburg or anything I can recognize from Google Maps. Lake St. Clair is to the north in the figure, but it's also not on Google Maps near Kecksburg. I also checked Mapquest, no luck. There is also no mention in the paper of the U.S. military going to the site. The authors of the paper also admit that they are uncertain as the velocity of the meteor. I think the skeptical position on this case needs to be tightened a bit. "Safe at Any Light Speed"
Please return your KORVAIR-2900 to an Acorn dealership in the nearest galaxy for immediate repairs. You can see the 'Roswell connection' here. I am willing to bet that the original 1965 story never mentioned hieroglyphics, never mentioned the military ordering people away from the scene and never mentioned the fire station being occupied by soldiers. These are all 'add ons' and grew from the Roswell tale which got its big publicity in 1980, and the above 'extras' do match Roswell quite well. True, there are no bodies with Kecksburg (at least not yet). Instead we have the military carting off a huge acorn-like object. And what became of this object? Presumably it is stored with the Roswell wreckage, along with all the rest of the recovered crashed ET craft that our space visitors seem so inept at handling when they get close to planet earth. cda: "Presumably it is stored with the Roswell wreckage, along with all the rest of the recovered crashed ET craft that our space visitors seem so inept at handling when they get close to planet earth." All stored along side with the Ark of the Covenent, Spear of Destiny, the Nazi Bell, plaster castings of Big Foot feces and the secret recipe for making party pleasing chemtrails. You forgot the crystal skull, Tim. Oh snap! I remember this from an episode of Unsolved Mysteries when I was a kid. Their acorn was silver though. Yes. That's the reason that Robert Young's article about Kecksburg was called "Old Solved Mysteries." Interesting article by J. B. Hare: http://www.sacred-texts.com/atl/ataw/atawintr.htm. Skeptics and Claims of "Earthquake Lights"